Some months ago, I noticed something odd going on with the FG. Every now and again, at seemingly random moments, the 60/125 lights would start blinking and it would fire at 1/90th only until I opened the back and reset the counter. It would then function as normal: 1/90th for the first few frames, then normal operation, more or less, until it happened again. Other people have had similar problems with the FG and other Nikon cameras that have a similar feature. I found many people with similar problems, but little information on how to fix it and loads of dire warnings. Just under the frame counter wheel, there are two copper strips. One connects to the frame counter; I don’t really know where the other one goes. When you open the back, the frame counter resets and the copper strips separate. 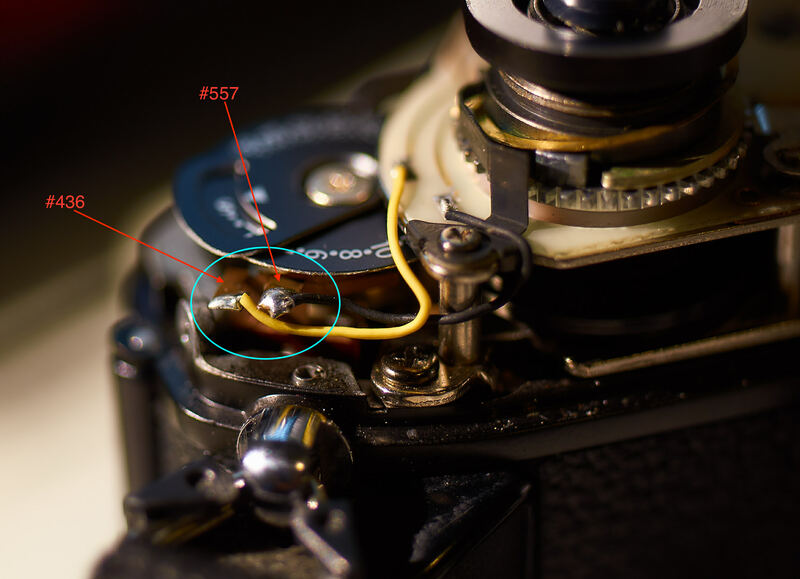 As you trip the shutter and thumb the advance lever, the counter inches up and at Frame 1, one of the copper strips moves and the copper strips complete a circuit, activating the meter and unlocking the shutter speed. The repair manual that I picked up describes this: “Just before frame counter reaches ‘1’, Switch blade #436 is contacted with plate #452 to close frame counter switch.” There is no mention of #557 in the repair manual, and in my testing, connecting #436 and #557, bridging the gap between them or pressing them together, completes the circuit. Over time, and with use, these strips can get dirty. In my case, I suspect corrosion from humidity, water and/or sweat. The problems started during or after the Chicago trip last summer and got worse last winter when a slight rain started up while I was shooting on a brief hike in Arkansas and the camera got a bit wet. I hunted around on the internets and found some general instructions for how to remove the top, and decided to have a go at it. 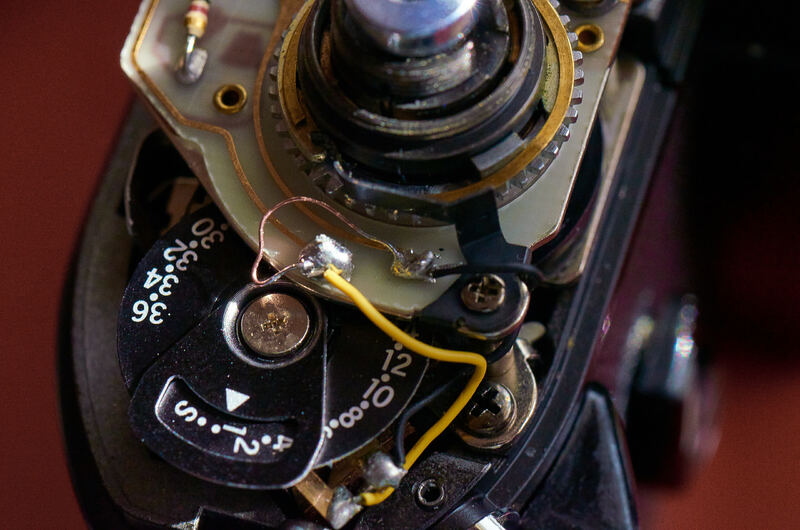 With a bit of elbow grease, some determination, and help from God, I managed to remove the advance lever and shutter speed dial, but couldn’t get the rewind crank to budge. I felt quite defeated and just stared at it for awhile, until I noticed a bit of green corrosion on a little copper knuckle near the shutter release. I cleaned that off, put the shutter speed dial and advance lever back on, and the camera worked fine for a few weeks. Hooray! I was absolutely thrilled and just knew I’d solved it, but then it started up again and it just got worse and worse, until the meter wouldn’t turn on at all. I really wanted to fix it, but the forums had me a bit scared and I couldn’t justify sending a 30 year old camera in for repair, so I started shopping for another FG. I found a promising looking one and put a couple of bids on it, but once it got above $80, I dropped out… Mine came in mint condition with a barely-used 50mm 1.8 E for $64, so I wasn’t about to pay more than $80 for a body, especially one in I-don’t-know-anything-about-cameras-and-haven’t-tested-this-at-all-but-it-looks-good-to-me condition. I hunted some more, and did some research, and ended up buying a Nikon FE (in aforementioned looks-ok-to-me condition, and in desperate need of new seals) for pretty cheap. The FE is a great camera, really. I like that the meter turns on when you pull out the advance lever and turns off when you push it back in, and the match needle is far superior to the LED lights, but it’s a bit bigger than the FG, there’s no finger grip on the front and it’s not quite as comfortable to shoot with as the FG (for me). After shooting with it for a few months, I started pining for the FG and so I decided to have a go at repairing it… The worst I could do was break it even more, right? I hunted around awhile and finally found Lensinc.net, where I purchased the aforementioned repair manuals for the FG and newly-acquired FE. With some take-apart instructions in hand, out came the tools and I got to work. The advance lever and shutter speed dial were easy, but I got stuck again at the rewind crank. It just wouldn’t budge, so I set the project aside for a few weeks until I got up the nerve and attacked it with “Bismillah,” courage, and some needle nosed pliers. I think it had some loc-tight on it or something, but after two full, very stiff turns with the pliers, something gave way and it unscrewed with no problem. Under the rewind crank there’s one of those screws that require a spanner wrench. The one under the advance lever came off with a flat head screwdriver and some (forced) words of praise to God, but the one under the rewind crank wouldn’t budge. Somehow, those two copper strips are supposed to connect and complete a circuit on the control board via the yellow and black wires. Something prevents the connection, but I couldn’t really get a good look in there. I pondered what to do for awhile. The forums mentioned cleaning the switch, and I tried to get some paper towel wrapped around one tine of a pair of tweezers in the gap, but I had no luck. (I left the batteries in and periodically checked to see if the most recent attempt worked.) I tried again with various implements, all with no joy. Thinking about it again now, I was trying to clean between the two copper plates, and I think I misunderstood how it works. I thought the two copper plates snapped together, but realize now that #436 touches the plate underneath the frame counter wheel, and maybe #557 always touches the plate and the plate makes a connection between #436 and #557… So maybe I could’ve cleaned the plate easier (probably… it’s right there, really). Hindsight is always, or usually, 20:20, more or less, and, anyway, cleaning didn’t solve it. I took off #429, but it’s just the little window that holds the arrow that points to the frame number. I unscrewed #550 and #549, but nothing came off with #550 and #549 is just the lock button. 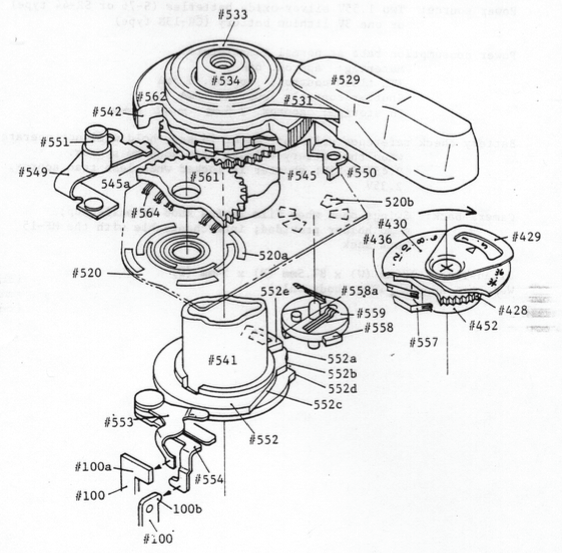 See the parts labeled #561, #564 and #520? I had made my first (and only, I hope) major error. The little fingers have to be positioned in exactly the right spot, otherwise the shutter speed dial and the meter won’t match, and the camera won’t perform as you expect. There’s a little circle with a dot in the middle on one side of #561 and three dots that form a radius sort of line on the other side of it, but I found no indication of what they might correspond to, but the circle with a dot in the middle looked sorta like a lens, and so I lined it up to face the front of the camera, held it in place, put the shutter speed dial back on and checked the viewfinder. Things were a bit wobbly, but the viewfinder showed 1/500th and the shutter speed dial showed 1/500th, so I screwed #564 down tight and went on with the repair job. The cleaning operation failed, after thinking on it for awhile, I hit upon a different solution, one that would fix one of the minor complaints I have about the FG: that whole ‘meter off until frame 1’ thing. 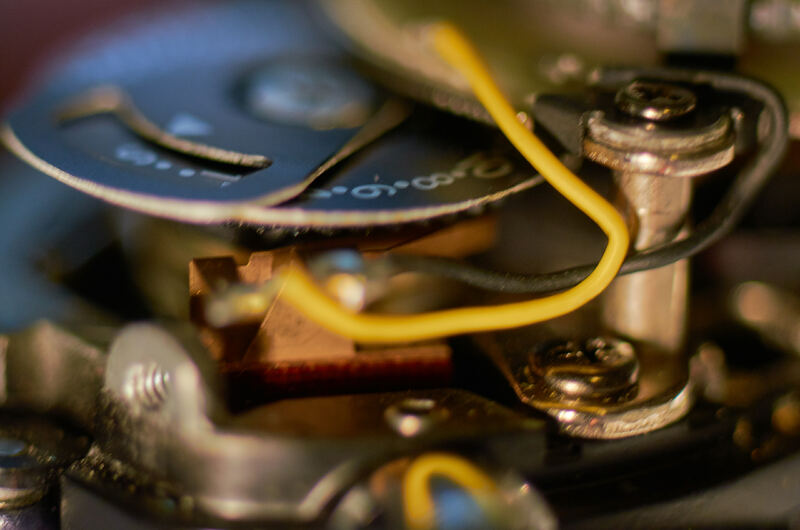 I wondered: if I jumped the wires, if I macgyvered something together to permanently close the circuit, what would happen? I tested it by holding a flat-blade screwdriver against the tops of #436 and #557, and… it worked! I tried to tape a bit of safety pin to the solder points, but that didn’t provide a solid connection. I thought about cutting and splicing the wires, but didn’t want to permanently damage anything. And so I did the most sensible thing, I think, and while it’s not strictly a macgyver-esque solution, I went down to the nearest Radio Shack and picked up a soldering iron and some solder. I snipped off a piece of speaker wire and tugged out one strand of copper wire. I’ve never soldered before, and hadn’t seen it done in 25 years or so, so I called Samie in for some help. In about 10 minutes he had it… A bit sloppy, perhaps, but functional! The shutter speed dial was set at 1/1000th and I looked in the viewfinder and found… 1/500th. I flipped to A and checked: 1/1000th. I flipped to P and checked: 1/1000th. I flipped around to 1/50th and things went all screwy. At 1/500th and above, it was one stop off. Anything below 1/500th was totally haywire. I took everything back apart again, and had a good look at #564. Sure, the circle with a dot in the middle looked a bit like a lens, but it looked much more like the shutter release. 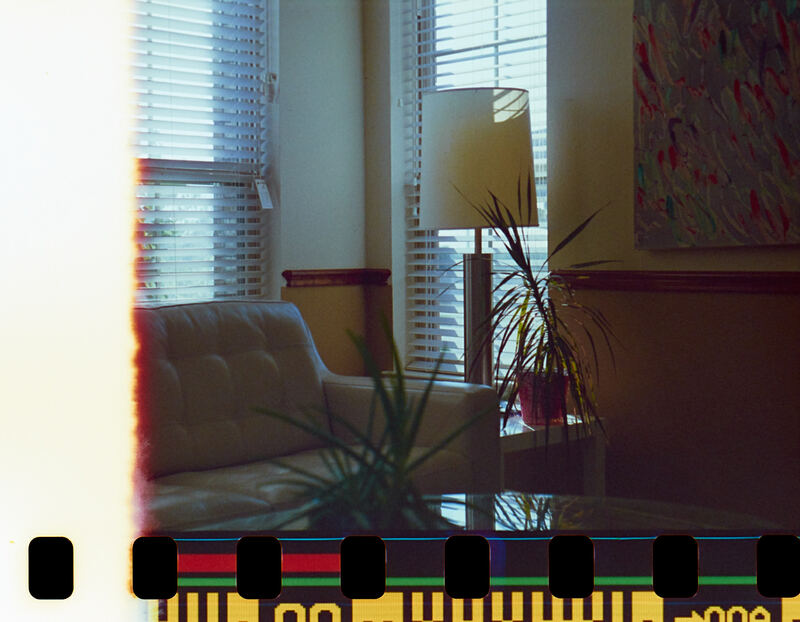 Yes, that’s part of frame 00, correctly exposed, in A mode, on a Nikon FG. To fix the malfunctioning frame counter switch, you can clean it—good luck—or you can hack it. I wasn’t able to clean it, so I hacked it by soldering the switch closed. It’s easy enough, you just need to connect the yellow wire and the black wire. There are dozens of ways to do it: I used solder and a bit of copper wire. Once you get the cover off, it’s really trivial. Just don’t go unscrewing random things… With the frame counter switch effectively turned on, you’ll gain an extra frame or two on every roll: GoGo. I know of no drawbacks to this approach. The meter shuts off after 16 seconds as normal, all the auto modes work just fine, and my FG works like new again. I disclaim all respnsibility for what you do with your camera and your soldering iron, but I expect this will work similarly for any camera with a similar frame counter switch. YMMV, of course. Thanks for this article. I have an FG exhibiting this exact behavior, so I’m sure this is the issue. I like that it’s a permanent fix, and not something that’s going to need re-done in a year or two (ie cleaning the switch mech). It may not be 100% permanent, but I’m 6 months and a dozen rolls in, and have no problems at all, and now get an extra 2 frames out of each roll. So GoGo. You’re welcome, and BTW, I affected the repair over the weekend and it woke my meter up as expected. Yay! !